The graveyard in Manister is to the front and to the back of the present parish church. Killanahan, also known as Kilonehan, was a parish in its own right. 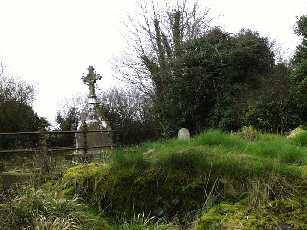 The cemetery at Killanahan is difficult to access, and is mostly overgrown. There was once a church here also, although no trace of this now remains. There are several Palatine graves here, as well as a tomb. Famine victims were buried in a graveyard called Cealltar. Today, this graveyard is only accessible through the lands of the Skelley family. A wall surrounds it on all sides. The graveyard is very overgrown but there are plans to clean up the site. Within the walls of the graveyard, there also appears to be the walls of a church. There are a number of headstones in the graveyard but due to the difficult terrain, we were unable to venture throughout the graveyard and discover the oldest headstone. Many of the headstones have fallen over or illegible; a number of them are believed to date from the 1700s. A headstone of mention is located besides the stile. It is a large Celtic cross in memory of Mrs Cornelius O'Dea and her son William, whose religious name was Br Jerome. Mrs. O'Dea died on March 7th 1868, at the age of 62, while Br Jerome died on October 1st 1875 aged 27. There was supposed to have been a Kyle in Dromlohan. Both Catholics and Protestants are buried in the Protestant graveyard.